Today’s natural resource managers and policy makers operate in a rapidly changing landscape. Decision makers must contend with biophysical shifts from development and climate change, as well as changes in economic development patterns and social values, like growing interest in renewable energy and market-based conservation. 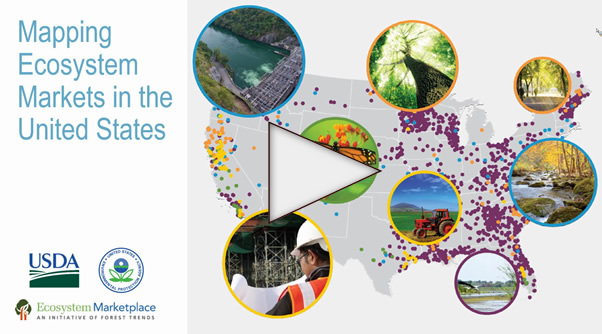 To make sound decisions, leaders need a comprehensive and continually updated understanding of the dynamics at play in managing natural resources. Recent years have brought a steep increase in publicly available scientific and social data, but making sense of these inputs in decision making is not always easy. It’s in this context that Forest Trends’ Ecosystem Marketplace, the U.S. Environmental Protection Agency (EPA), and the U.S. Department of Agriculture’s Office of Environmental Markets have formed a partnership to help actors interested in environmental markets identify and understand key market trends and patterns across the United States. 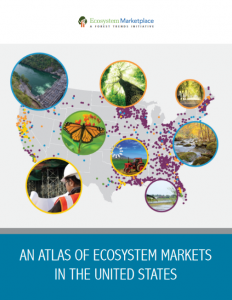 The goal behind An Atlas of Ecosystem Markets in the United States is to provide proof of concept of the value of mapping US ecosystem markets in the context of scientific and demographic data that help to shape markets and decision-making. 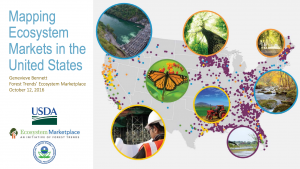 These maps also function as a useful introduction to ecosystem markets in the United States for those unfamiliar with the field.